In the above table, there were some data sets which were not complete. So long as there was some data, I assumed that divorces/marriages (whichever was missing data) would have kept up at the same monthly rate for the rest of the year, for the part of the year from which missing records start. Where a year's marriage or divorce records are missing entirely, I did not do a calculation for that year. 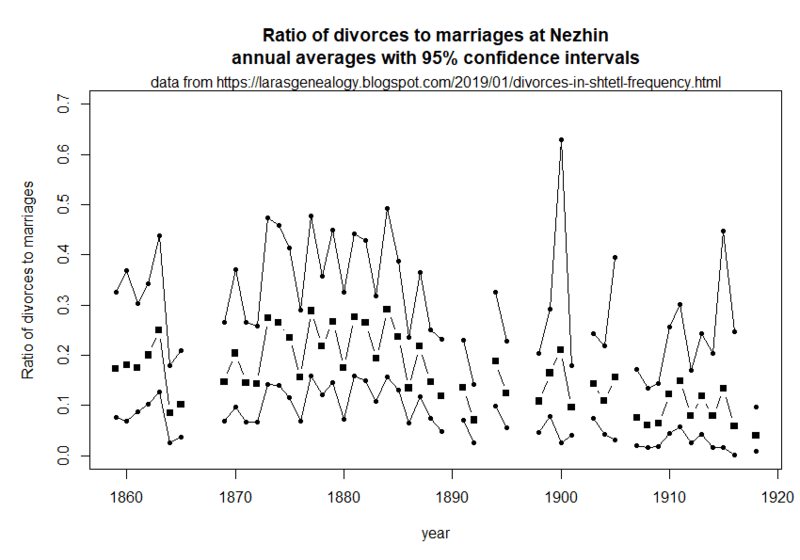 Drops in the marriage/divorce ratio seem to correlate to war or other unrest. There is a drastic dip in 1864 & 1865--right when the Crimean War was causing mass military drafts (and ensuing deaths) of Jewish males. The numbers dropped again starting in 1906, just after the first of several large pogroms in Nezhin (in October 1905). There was significant unrest through the end of the data, as pogroms led into WWI which led into the Russian Revolution. There were decades when over 1/5 of the marriages ended in divorce. 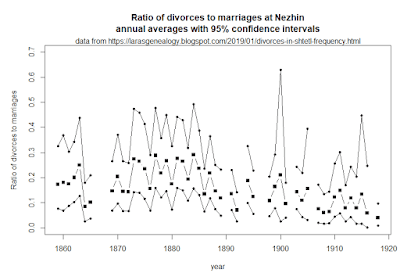 There were specific years (particularly in the 1870s and 1880s) when close to 1/3 of marriages ended in divorce. Divorce wasn't rare at all! 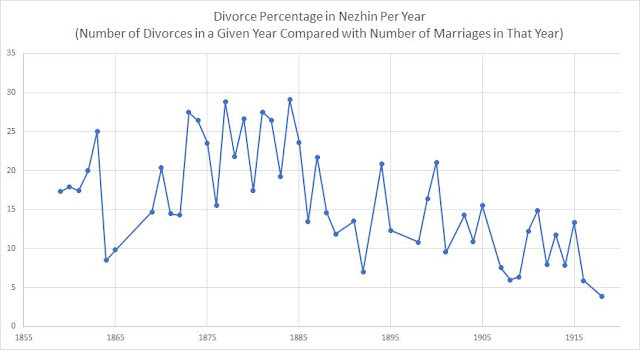 So while this isn't a comment on the pros or cons of divorce, it's a message to American Jews--things weren't always better in Eastern Europe. The Jews of the Russian Empire were human. Divorce happened. What do you think? Is this what you would have expected? Maybe not geek enough :) I couldn't resist checking significance of the trends by Fisher exact test. The difference between the rates of 1859-1863 vs. the low-points of 1864 and 1865 is formally barely significant (p=0.04) but we ought to require a tighter p-value because we cherrypicked the intervals. Anyway Crimean war was over 8 years before the dip (and post-war draft was at all-time law, with many years of skipped recruiting as the military drew down from the outsize draft of the 1853-1856). In contrast, the difference between 1870s vs. 1890s-1900s is stark (p-value less than 0.00001). I believe that it reflects the economic crisis of the shtetle caused by the 1883 reforms, especially by the mass eviction of country Jews in the years which followed, and ban on new village settlement. Forced re-urbanization purposefully destroyed the shtetle economy, and dditional economic and educational bans made the things even worse. It was the government's plan all along to reduce Jewish population by starving the shtetle until its residents run abroad. And typically, economic crises take 3 to 5 years to seep into the public conscience. What the main reason of divorce? Chillness? I'll be posting about divorce reasons probably next week. So stay tuned. Interesting: An uncle of mine was born in Belarus around 1880. His parents divorced right after his birth and she returned to her Shtetl where she immediately married a first cousin. Both I and one of his daughters (my first cousin) agreed that it was probably a shotgun marriage. 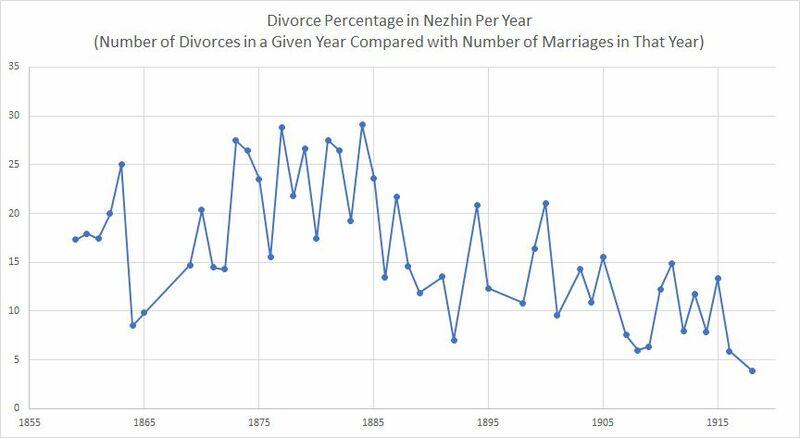 It's uncommon to have such a complete data set for Jewish marriages and divorces in the Russian Empire, and this analysis yields fascinating insights into a rarely examined aspect of shtetl life. 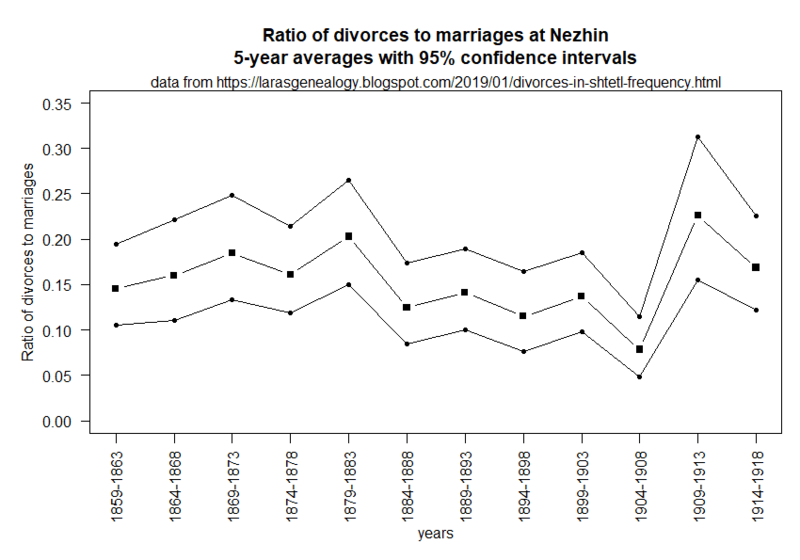 What is the current divorce rate in subsets of the Jewish community? Possible to collect data? I can just imagine a rabbi sitting there in late 1870s-early 1880s, shaking his head: "These youngsters! Nothing is sacred to them anymore! So many divorces... what is the world coming to? In my time.."
Cool! I'll check if Amazon has it. Actually kind of "yes". Initially I was shocked at the divorces I found in my family, since I had always heard that people just did not get divorced "back then". I was the one who informed my 75 year old mother that her aunt had been divorced back in 1938. (She was shocked and then snickered a little). I had a great great grandmother/grandfather pair who divorced in 1904 and both ended up remarrying. I was not expecting that in the beginning of my research, but now, it does not cause a second look. It happened. It was normal. But it was not part of the family story to pass on. That is a shame. If you figure in desertion, the marital unhappiness rate is even higher.